BKT Tyres manufacture the W207 Wing ATV tyre with a 6 ply rated reinforced natural rubber casing making it one of the most puncture resistant quad tyres on the market. The deep open wing tread design has hollow lugs to improve mud clearance and maximise traction. Large, aggressive shoulder knobs wrap down to the sidewall for excellent side bite and added protection when the going gets tough. 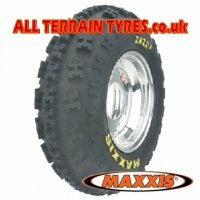 The W-207 tyre has a colour hot patch on the sidewall. Definitely the farmers favourite!